I’d been bleating on here about my physical state for a week or so leading up to this race and moaning that I didn’t feel like racing at all, being honest. Simon, my team mate for D2D had also been suffering with a cold for a couple of weeks so we were unofficially ‘Team Crocked’ (this was the first time I’ve raced in a pairs category). 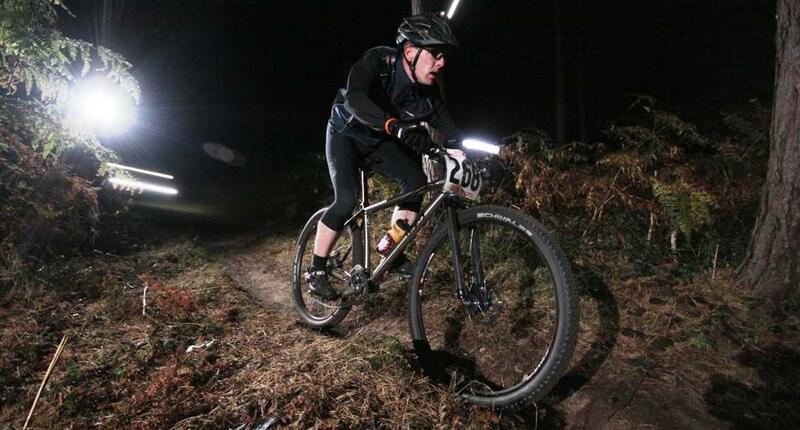 We had a plan B that involved drinking beer and spectating for most of the 12 hour race but that would in itself be a huge disappointment as Thetford Forest is definitely A Very Long Way Away Indeed. As per the weatherman’s prophecy, Thetford was dry, a bit windy and a bit sunny. We’d brought Michael’s bike with us so we went for a practice lap after meeting up with Simon and signing on. That practice lap was pretty cool as we did it wearing jeans and t-shirts whilst everyone else appeared to be wearing all the ‘right’ gear…I don’t think I’ll ever get all the chain lube out of my best jeans though. Lining up at the start, I’d arrived late, too late to get really close to the front anyway. As it turned out it didn’t really matter because as 8pm arrived and we all set off into the darkness of the forest, a huge gap seemed to open up before me, allowing me to pass rider after rider, only slowing occasionally on narrow singletrack, waiting for an opportunity to put some power down and surge forward across the rough stuff at the side of the trail to continue my tear-arsing past other folk. Mile after mile of grin-inducing singletrack was despatched efficiently as the bike reacted with me to every twisty-turny-wiggly bit of trail and accelerated out of every turn. 29ers? Cumbersome? I think not. Not mine anyway. I crossed the start/finish to hand over to Simon totally breathless having ridden harder in the last 50 minutes than I think I had done for a long time. The thing about Thetford, in case you’re not familiar with the area, is that it’s almost completely flat. This makes it sound easy, but it isn’t. There’s no climbing therefore there’s no descending (and thus no coasting). The most appropriate gear is always quite a high one. The vast majority of the course is twisty, swoopy singletrack so it’s a very physical place to ride and it kind of beats you up with the regular dips and bumps sending shocks through your lower back. The race went on and we’d totally forgot about Plan B, beer, heckling or anything else. We were racing, following the script of Plan A to the letter and just doing as best we could. I was finding the whole ‘one lap on, one lap off’ thing difficult as there’s not much time to rest but plenty of time to get cold and stiff so I was glad that we decided to start riding double laps through the night, allowing time for a proper sit down (perhaps even a sleep), some quality eating and a good faff with the bike. When I was on the bike it was easy however to find myself slipping back into my regular 24 hour soloist ‘maximum 70% of max HR’ pace and I had to really concentrate to make sure that I was riding as fast as possible all the time. This was where my lack of fitness and fatigue manifested themselves. I’d do my first of 2 laps really fast (such as a fantastic high-speed 10 mile big-wheeled duel with Jo Burt), then I’d need almost half of my second lap to recover, eventually picking up the pace and caning it again before flopping into a crumpled heap in the van with a sleeping back over my head. I wasn’t sure if Simon was having similar problems as for the whole 12 hours of the race I saw him only at the changeover point. “You alright?” “Yep” “Right. See ya.”, was pretty much it, apart from when I announced that I thought I’d broken my finger in a spectacular over-the-bars crash which probably surprised the bloke behind me as much as it did me. Anyhow, it bloody hurt. It still does. I think it’s broken. I’ve also got a bruise on my leg the size of a Wagon Wheel. When I eventually bothered to look at the screen next to the timing tent (about 8 hours in) we were one lap behind the leading pair. Looking back at the lap times on the website yesterday we were in the top ten at one point but something happened towards the end – we’re not sure what, presumably some teams had laps missing or something – that dropped us down to 11th place (out of 84), 2 laps behind the winners of the pairs category. We’re were a bit disappointed by that as we thought we’d finished inside the top 10 but it wasn’t too bad a performance. 14 laps between us was a lot better than we expected in fact. Racing in the pairs category throws up a load of interesting challenges. Poor rest but also having to go really bloody fast, lack of communication with your team-mate but worst of all, it’s the changing of clothes after each hard lap. What an utterly ace event though. Great course (even better than CLIC? ), great atmosphere, loads of familiar faces and the cheesiest collection of music I’ve ever heard played since 1982. This one’s definitely on the ‘things to do solo’ list for next year. Ouch – bet that typing hurt too with your finger injury. Get better quick and well done anyhow. Was a nice night for it. ‘Bruise the size of a wagon wheel’? What, a new one or the real ones from back in the day – ‘cos if it was one of them you must have nearly died of it. course even better than CLIC? !